Asset management is the process of guiding the acquisition, use and disposal of assets to make the most of their service delivery potential, and manage the related risks and costs over their entire life. 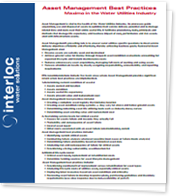 Download the latest Interloc White Paper, Maximo in the Water Utilities Industry, to get specific best practices guidelines when implementing Asset Management for the Water Utility Industry. This paper will help you start to address specific challenges you might face when trying to meet specific service delivery objectives efficiently and effectively, to achieve business goals. Complete the form on the right to download the paper now!